A cocktail made by combining the amazing flavor of sweet iced-tea with vodka on the backdrop of a sunny day, is too tempting to pass. Tastessence gives you 7 ways to make sweet tea vodka drink at home that will help you beat the heat. Using a tea infuser for loose tea is a bad idea. The issue with the device is that it doesn't allow the tea leaves to unfurl completely, and hence will not unlock the true, magnificent flavor of the tea. Which is why, choose to steep the tea leaves in either a teapot or a brew mug where it can unfurl and move without any constraints. As the name suggests, sweet tea vodka is acquired by infusing vodka with tea, and is slightly sweetened. There are many popular brands out there, like Deep Eddy Vodka, Firefly, Seagram's, Sweet Carolina, and Jeremiah Weed, that produce and sell a wide variety of sweet tea vodka. One way to prepare mouth-watering cocktails at home is by purchasing any of the above flavors produced by these brands. You can also choose to make your own concoction at home. The process is quite simple, doesn't require too many ingredients and has optimum steps. All you have to do is gather the ingredients and follow the directions mentioned below. 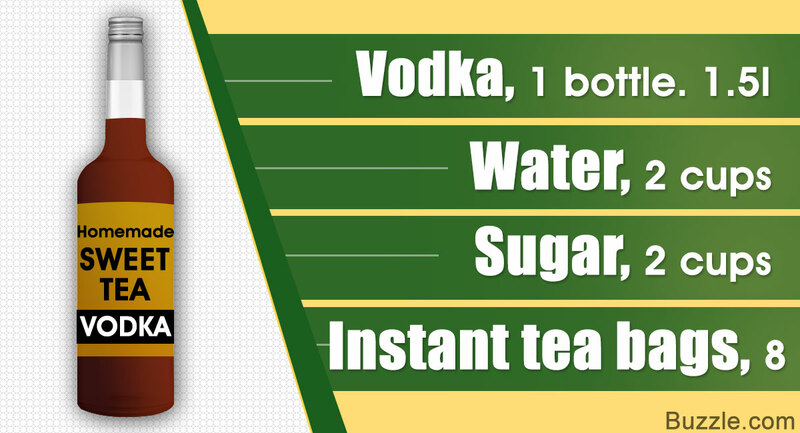 Before you get to the drinks, let us first concentrate on infusing vodka with tea. We would like to advice you to follow this recipe to the tee, try it, and then make adjustment(s) as per your liking. In a large pitcher, empty the entire bottle of vodka. Meanwhile, let us prepare the simple syrup. For this, you need to boil 2 cups of water in a pot and then add the sugar. With a wooden spoon, stir the mixture until the sugar dissolves completely. Remove the pot off the heat and let it sit aside to cool down completely. Add the simple syrup into the pitcher, stir properly with a wooden spoon, and voilà, your very own sweet tea vodka is ready. Now that we have the delicious spirit ready, it's time to move on to preparing the cocktails. Sweet tea vodka, 2 fl. oz. Cranberry juice, 2 fl. oz. Pour all the liquids in except for club soda, and give it a good stir. Top the drink off with club soda and garnish with mint sprig before serving. Orange liqueur, 2 fl. oz. Sour mix, 1 fl. oz. Pour all the liquids in except for Sprite, and give it a good stir. Top the drink off with Sprite and garnish with an orange wedge before serving. Squeeze lemon juice in a highball glass or tumbler, and place the halves in the glass. Add mint leaves and crush it with a wooden spoon. Fill the glass with ice cubes and add the sweet tea vodka along with lemonade. Use a drink stirrer to combine all the ingredients properly before serving. Sweet tea vodka, 1 fl. oz. In a Pilsner glass, pour the sweet tea vodka in first and top it up with wheat beer. You can serve the drink with an orange wedge as garnish. Cinnamon whiskey, 2 fl. oz. Apple Liqueur, 2 fl. oz. Fill a highball glass or tumbler with ice. Top the drink off with club soda and serve. Orange juice, 2 fl. oz. Fill a Pilsner or highball glass with ice. In a cocktail shaker, muddle peach with orange juice. Add the mixture into the glass along with the sweet tea vodka. Give it a good stir, and garnish with mint sprigs before serving. Sweet tea vodka, ½ fl. oz. White rum, ½ fl. oz. Simple syrup, ½ fl. oz. Pour all the ingredients, except for garnish and Coca-Cola, in a highball or hurricane glass. Use a cocktail stirrer to combine the ingredients. Top the drink off with Coca-Cola, and garnish the drink with orange slice and mint sprigs before serving. In addition to the above mentioned recipes, you can prepare cocktails with peach and cinnamon schnapps, your favorite liqueur(s), limoncello, or orange and pineapple juice as per your liking. If you're an avid fan of sweet tea, but would like to add that extra kick, these sweet tea vodka recipes will be your savior. And the best thing about this refreshing summer drink is that you can make it ahead of time, and sip at a moment's notice.